The Garden of Gethsemane Brings the Isaiah 61 Anointing. Have you been feeling the weightiness and heaviness in the atmosphere? It’s filled with agony and despair. It’s crying out “if it’s possible please take this cup of suffering”. The waves come crashing one after another. In a vision - I see the puddles of blood beneath us. What is this I ask the Lord. What am I going through? Do you feel it? Often God will speak to me through “sympathy symptoms”. I can “feel” the atmosphere of a room or even a city. I can sit next to someone and be able to feel what they are going through. God gives us this gift of discernment so we can intercede and bring breakthrough for others. I have been seeking the Lord for several weeks now on what I am experiencing and what others are going through in this current season. Someone recently asked me how they could pray for me and all I could say was pray for hope and endurance. Her reply was: You got it. At this point, that can only be supernatural; the human ability to hope and endure is long passed.That bore witness in my spirit. 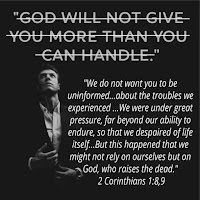 2 Corinthians 1:8-9 is a verse the Lord gave me to summarize the “physical manifestation of the garden.....We do not want you to be uninformed, brothers and sisters, about the troubles we experienced....... We were under great pressure, far beyond our ability to endure, so that we despaired of life itself. Indeed, we felt we had received the sentence of death. 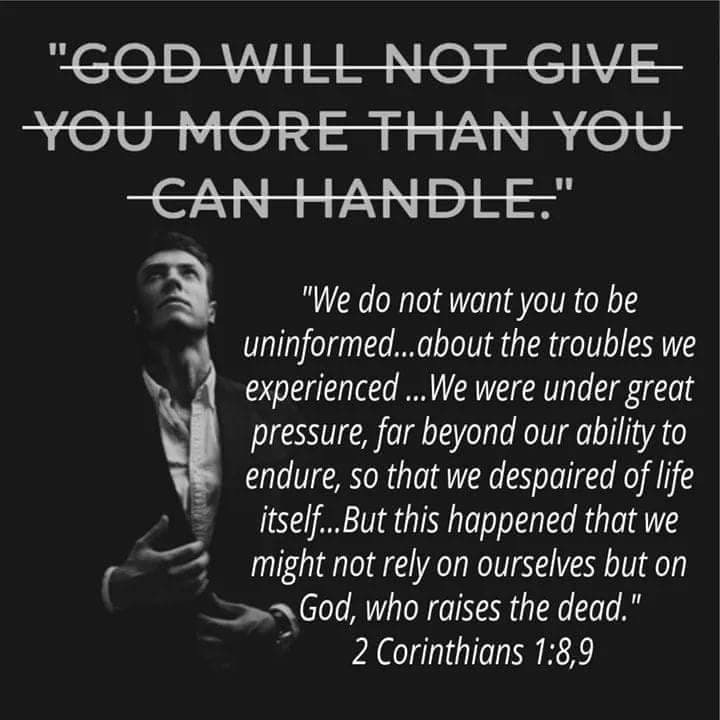 But this happened that we might not rely on ourselves but on God, who raises the dead. As I was studying this entire Garden of Gethsemane passage out, I found that Gethsemane means oil pressed. A place where you are crushed. The more crushing the more oil. It’s a place where you need to come if you want to carry the oil for the new wineskin. It’s where you say Lord, if you can remove this cup of suffering, please do, BUT not my will be done, but YOURS! The Lord showed me that without the betrayal, without the garden experience, He would never stepped into his purpose, call and destiny. The same is so for us. like things are getting darker and darker. Those that the Lord will use mightily and are being crushed and pressed beyond what they can endure naturally, will receive the Isaiah 61 anointing in great measure. He took me into a vision - In the courtroom of Heaven, I saw me as beautiful bride in a white flowing dress with white gloves on and the Lord is twirling me around in front of Satan. He is showing Satan how much He adores me and lavishes good gifts on me. I have sparkling jewels and diamonds on my crown and on my neck. I am a picture of beauty and health. The Lord ushers me out of the courtroom and into a white horse drawn carriage. He is whisking me away into a beautiful destination…a glorious future - which begins now He says. I am taking you into high places to make a different in lives, countries and leaders - across the world. We will all work together in unity and perfect harmony - as a seer and as a prophet with discernment of spirts and tremendous healing and miracle anointing. You will be My Isaiah 61 Bride! This is the year(s) of the Lord’s favor I’m ushering you into now. You are a Deborah & Esther and Isaiah! The Isaiah 61 anointing will be used in Five Fold Equipping Hubs across the world. These hubs will have the new oil in a new wineskin. These people are sold out for God and will accept nothing less than God’s ways and God’s best. Exodus 33:15 If your Presence does not go with us, do not send us up from here. These people are being buried now so they can be resurrected and burn brightly for the days ahead. This group of believers will be fully surrendered to the Lord and submitted to others so that the true five fold ministry can come forth. These people have been in training their entire lives for such a time as this. These hubs will be places of refuge, healing and restoration, discipleship, training, mentorship and equipping. The Josephs are rising up and being put in place. A friend of mine, Terry Gallegos posted this just a couple weeks ago. When I saw it, it confirmed the “physical manifestation” God had me experience. I wanted to share with you. Stressful situations will reveal your faith to yourself, not to God. He already knows for all things lie bare and naked before Him at all times and in all seasons. The church has lost sight of the Gospel and it’s dunamis power because they have lost sight of Jesus Christ and been seduced and deceived into believing in a Jesus who is powerless to deliver and make whole his own body. They have been drinking wine that has been mixed with flesh and bones of mankind. God has had His inner circle, like Peter John and James in His Garden Of GETHSEMANE for quite some time in order to reveal himself to them in such a way that when they are crushed by the Lord's doing in His Oil Press. That one drop of precious oil has been squeezed, they will then be able to leave the Garden with their wine-skins full of a FRESH Revelation of who the Son of God Truly is - IN POWER in order to fill the cups of the masses with this New-Wine, with deep conviction, Love, Authority and passion for the Truth the Life and the Ways of Jesus Christ, the Savior of the World. This Garden-Place where some have been for quite a long season is a place of bended knees and crying out. They are Isaiah encounters and moments of clarity of your own uncleanness before a Holy God. They are the Moses moments that get your attention, and push you out of your comfort zone and makes your flesh very uncomfortable, to force it to let go of self, pride and self-righteousness, and to become submitted to God under true conviction ,, these are places to deal with the flesh and to rise up in the spirit, this is a place of GREAT CIRCUMCiSION of the flesh and bone, by the Spirit of God, places of GETHSEMANE are very uncomfortable to the flesh and it's ways. This Holy Ground is not a place to stand and prove your faith, it's a place where no flesh can stand in the presence of A HOLY GOD, but a place of falling down on your face before God and surrendering everything unto him, it's a place of the CONSUMING FIRE OF GOD. It is the required starting point of picking up your cross daily and following the SPIRIT OF CHRIST forever, laying yourself down and bearing this Cross through out your lifetime. It’s a place where all believers must visit in order to fully comprehend Gods will and fulfill His Purpose. It’s the place where you must take off your shoes and come as you are to meet God in an unusual way and manner---- The Holiness of God. It's a place of sifting. It's a place of dry-bones. This is a place where the flesh and the spirit collide, head-on, it's a place where the things you couldn't let go before, you can now come to the point of putting those thing down once and for all, this is a place of endings. It’s a place where wrongful unholy desires die, and new God given desires are born. This is a place of death, but yet life. A place of Great Shifting and SHAKING everything that can be. A place where you cry out all the day long praying the prayers of faith over and over again like Jesus, with all your heart but to no avail, nothing is responding to your hearts plea. It's a place where you feel very alone and where confusion and chaos seem to me the norm every moment in your stay. It's a place where you come to know what God already knows about yourself that you didn't know about yourself before you entered. It's a place where your faith is put in God alone for the first time in your walk and is made pure and simple to walk out the Gospel with simple faith of a child. This is a garden place that has been for some, a very long season of sweat, and great agony and suffering and sorrow, it's not a place for the fainthearted nor the one who is not devoted to the Savior and who desires to please Him with their lives. Yes, this is a place where many venture not nor choose to enter. Some are drawn by the Spirit here, some choose to enter on their own, and some have no choice and have been chosen to be there by their Maker. Many leave, some choose to stay until the end and some will never ever experience this Holy Place of God. Friends are welcome, but can go only so far with you here. It’s a place where you come face to face with not only the reality of your professed faith, but a place where your entire heart is revealed before God and others to see, and yourself. It's a place where no-one can really help you to survive nor understand enough to give you words of comfort or encouragement. You seem to be in survival mode 24/7 barely staying afloat. This is a place where many have physical ailments and weaknesses and sicknesses manifest because of the intense struggle between spirit and flesh, and can become a place of deep depression and hopelessness. The warfare in this place can become most intense at times and if not for the Grace of God no-one would survive it. This is a place and time in a true believers life that when all the dust settles, and the smoke clears off the battle field and we are left on our knees and our faces with drops of blood dripping from our brow when we can truly rise from this holy Ground, bear our cross, suffer for Christ and the gospel, and truly be changed for evermore,, it's the only place we can truly say from our heart FATHER NOT MY WILL, BUT YOURS BE DONE!!!! IT’S THE PLACE WHERE WE COME FACE TO FACE WITH THE LIVING GOD. Where we are tested to the utmost and asked whom we will choose to serve. 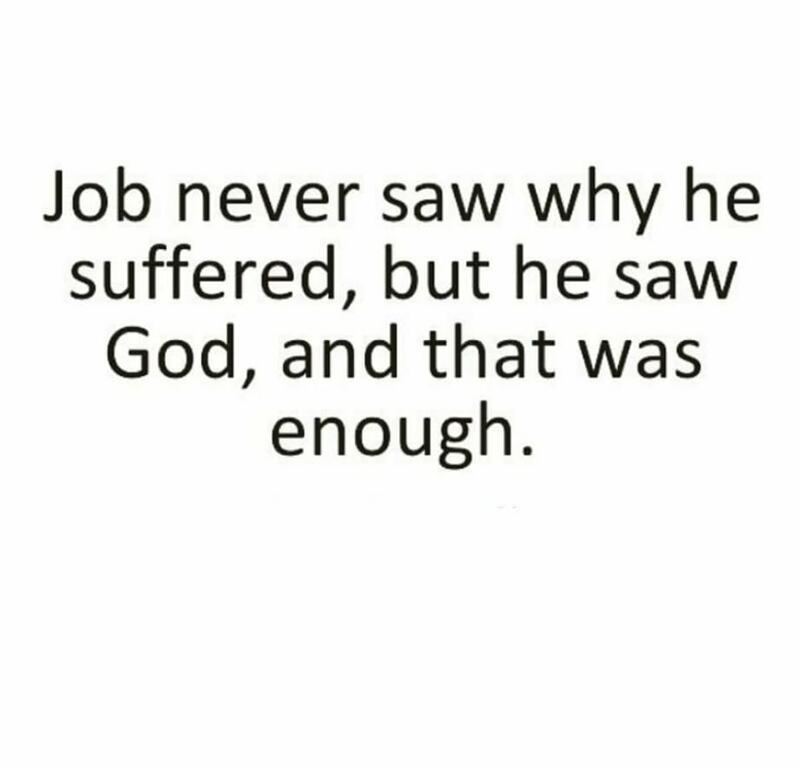 It's the place where Job came to in his own Garden-moment and in the end said, "I HAVE HEARD OF YOU BY THE HEARING OF THE EAR, BUT NOW I CAN TRULY SEE YOU, AND WHO YOU REALLY ARE, AND THE THINGS I HAVE UTTERED ABOUT YOU I LACKED KNOWLEDGE AND DID NOT UNDERSTAND WHO YOU TRULY WERE, FORGIVE ME OH GOD. 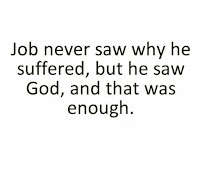 This place has an end, like Job, God seen fit to bless him double for the trouble and made him an Intercessor, a prayer warrior for those who still could not see the HOLY GOD THAT JOB NOW SAW. IT’S A PLACE YOU WILL FOREVER BE CHANGED, AND A PLACE YOU WILL NEVER EVER FORGET. You will BE THANKFUL TO GOD FOR THE INVITATION TO COME. I PRAY THAT WE SHALL ALL DESIRE TO ENTER THIS PLACE OF CRUSHING. I PRAY THAT WE WILL ALL COME OUT FOREVER CHANGED WITH OUR WINE-SKINS FULL OF THE NEW-WINE OF JESUS CHRIST HIMSELF. BLESS YOU ALL SAINTS. I was on the phone with another friend and when I was sharing my experience, he started to share what God had been showing him about this. The revelation of Jesus is an explosion of truth spreading out across time. It explodes over the macro-story of the world and the micro-story of a single life. Whether you pursue Him or not He is always revealing because His created order is the definition of reality. He, the logos blueprint, is inevitable. You cannot avoid Him and His reality, but you can sure try. In Gethsemane Jesus foresaw the suffering of the cross. His humanity wisely asked to avoid it while His spirit boldy entered. Here we see profound revelation. The cross models a major part of His created order: the cycle of life to death. We see this cycle everywhere (Ecc 3:1-2) in creation yet we resist it. On one level that resistance is wise. No one should seek the suffering of death. On another level that resistance undermines us when it takes the form of denial. Denial of death pretends that no deaths are coming and no deaths are necessary. Such denial is foolish becomes it assumes that “I have it all together. None of my habits and patterns need changing.” Change is frightening because it means leaving the familiar. Change is necessary when the familiar is no longer working, when the familiar in fact is killing us. And yet it is so normal to cling to that filthy rag. The familiar served us during the current phase of life. The success of the familiar taught us to cling which makes it hard to let go now. Nonetheless we eventually must admit our filthy rag has only one fitting use: as a burial cloth. We’ve all had moments where we realize the old familiar way no long works. We can choose to be wise and let the old go, or extend our suffering with denial. Jesus models this moment in an incredibly honest way. He does not rush to suffer nor does He deny the need to transform. He asks the Father to remove suffering and simultaneously submits to a suffering death. Sit in that. His words are beautiful and perfect in honesty. In His submitted state He does not deny the suffering that comes before death. He walks in bravely and quietly. He is resigned and submitted. The experience is brutal, bloody, and ripping, but it is not prolonged. It is submitted and understood as part of walking in the Spirit. Jesus foresaw the other side of death: resurrection in a newly glorified fleshly body. He knew that the act and blueprint of His approach to death and His actual death would provide His bride with atonement and a reusable pattern for all of our deaths (Romans 3:18). Make no mistake, we do not have a single life and then a single death. We have life, death, resurrection, life death, resurrection, life, death, resurrection, and so on. Yes there is one big death and there are many many smaller but profound deaths: losing a job, losing a marriage, losing a family member, giving up a habit, admitting something hidden, confessing weakness, accepting help, surrendering perfectionism, surrendering judgement, forgiving, admitting our lack of knowledge, admitting our obsession with knowledge, and so on. This is the nature of created reality as defined and demonstrated by our Logos. At each stage we must surrender the current stage completely (to death) before we can move to the next stage (transformation to new life). To say it simply: Along the journey of life we pick up things. Those things serve us for a time until they start to kill us. When they start to kill us we have to let them go. When we let them go we are gifted with new life: vision, understanding, and action. This happens over and over: Learning and letting go. Until one day, we surrender to the final death and receive the final resurrection in Christ. It’s glory to glory. A big part of the blueprint of reality is suffering, death, and resurrection. In Christ every death ends in resurrection. There are no deaths in Christ without resurrection. Mark and Jennifer were raised in the church to minister parents, met at bible school (Vanguard University), and love hanging out with ministers. The Spirit has built in them a desire to serve those who serve: ministers, veterans, and nonprofit leaders. They minister from Dayspring Ranch (DayspringRanch.life and FlamingArrow.org) providing recreational, spiritual, and mental health counseling including equine assisted therapy. Mark is a licensed marriage family therapist in Oregon and California. Jennifer is a licensed teacher (MA Education) and an equine specialist with EAGALA. I pray these words provided insight into what may be a tough season for you. Though I don't enjoy the garden experience, it is necessary for me/us to step into all that God has for us. It would be a whole lot easier to have Him just take me home, believe me, I've asked numerous times.....but I don't think that's in His agenda. God has promised me He will see me through this season and that I will come forth as gold. I just hope it's soon!!! Keep your eyes fixed on Jesus - the author and perfecter of your faith! We have a large bill coming due in the next few days... we are trusting God for the ability to pay it. He has not failed us yet. Would you please please pray that things we have listed for sale, would suddenly sell. Ongoing health for me - and back pain for Ken - and sleep for both of us! And just continued hope and endurance..... Thank you.